America has had an interest in South Asia ever since its creation. Has it evolved or devolved? Who Should Read “The Most Dangerous Place”? And Why? If you want to learn more about the history of USA’s involvement in South Asia – there’s certainly no better place to start than Srinath Raghavan. Be warned though: South Asia means “India, Pakistan, and Afghanistan” here; even though we can’t suggest you titles, we’re pretty sure that there are better books on US relations with Bangladesh, Bhutan, Nepal, Sri Lanka, and the Maldives. Srinath Raghavan is a political commentator, bestselling author, and Senior Fellow at the Centre for Policy Research in New Delhi. In addition to The Most Dangerous Place, he has also authored three books on India’s security and foreign policies: War and Peace in Modern India, 1971: A Global History of the Creation of Bangladesh, and India’s War. For his work, Raghavan has received two notable prizes so far, the Infosys Prize for Social Sciences and the K. Subrahmanyam Award for Strategic Studies. 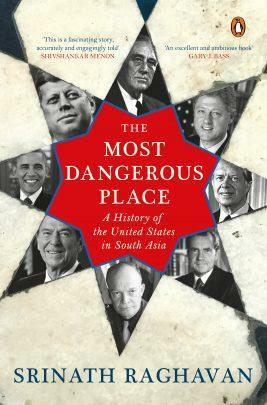 The Most Dangerous Place by Srinath Raghavan is perhaps the best book one could read if he or she is interested into finding out more about the history of United States in South Asia – India, Pakistan, and Afghanistan more specifically. At more than 400 pages, the book covers almost every event of importance – and many practically unknown in the West (and, thus, even more significant) – from 1784 to 2018, both through the eyes of South Asians and, for the first time – via thousands of pages of declassified documents – through the eyes of the highest echelons of American politicians. And, in retrospect, these have been two pretty eventful centuries, during which American interest in South Asian countries has come a long way; particularly in relation to Afghanistan after the fall of the Soviet Empire, and, even more, in relation to India after 1947. And after 379 pages of history, in the very last of the ten chapters of The Most Dangerous Place (“The New Century”), Srinath Raghavan turns to the most recent landmark events, covering everything from the effects of 9/11 and the invasion of Afghanistan to the nuclear rearming of India and Pakistan. America’s present interests in South Asia can’t be understood without a little history; and, without it, USA’s decision-makers will go on making the same mistakes over and over again – as they have already done quite a few times in the past. In a way, Srinath Raghavan’s final point is merely the corollary of an even more important one: the USA keeps getting South Asia wrong and tries to correct its mistakes by making new ones. In fact, that’s how the book opens, with an analysis of the expected versus the actual effects of the murder of Taliban’s then-leader Akhtar Mohammad Mansour via a drone attack in Pakistan, on May 21, 2016. However, the assassination delivered neither of these two desired outcomes. The Taliban quickly chose Mawlawi Hibatullah Akhundzad to be Mansur’s successor, and, under his leadership, Taliban attacks all over Afghanistan escalated. In addition, USA’s relations with Pakistan worsened, because the Pakistani government denied claims that it had been harboring Taliban leaders. As it was revealed about a year later, this was the truth: to say the least, the Pakistani Inter-Services Intelligence (ISI) wasn’t that fascinated with Mansur, and it might have been ISI the organization which created the trail that eventually led the Americans to Mansur. The war in Afghanistan [has] garnered the dubious distinction of being the longest war in American history: twice as long already as the Vietnam War. Despite a heavy commitment of troops and money, drones and Special Forces, the United States still [finds] it difficult to distinguish who [is] on which side of this tangled conflict. As stated in the “Introduction” Srinath Raghavan’s The Most Dangerous Place tries to illuminate the history and evolution of America’s interactions with South Asia – in addition to India, Pakistan, and Afghanistan, Bangladesh, Bhutan, Nepal, Sri Lanka, and the Maldives as well – through three lenses. This was the first thing which drove merchants of the young American republic to the Indian subcontinent somewhere near the end of the 18th century. However, the interest quickly waned, since American capitalists realized that they have a continent-sized market at home, so they don’t need another subcontinent for now – especially in view of the fact that, unlike theirs, this one was firmly under British control. However, the times changed, and after the 1930s, American interest turned yet again to the Indian subcontinent; and this time – it was a bit more personal. Consequently, financial interests were now both military and political – and it was difficult to distinguish where one of these ended, and another one began. On the other hand, even though Pakistan’s economy wasn’t exactly thriving, the USA backed India’s neighbor both politically and militarily – just in case India does move from the bloc of unaligned countries into the Eastern Bloc. The second dimension of the USA’s interests and interventions in South Asia is purely ideological. The brutality of the British conquest of India provided the background against which the United States could expound the blessings of American expansionism in the nineteenth century. Wilson and Franklin Roosevelt would invoke a similar distinction between American ‘leadership’ and old-world imperialism exemplified in places such as India. The US-led attempt over the past fifteen years to turn Afghanistan into a passably democratic state shows that the ideology is not merely a fig leaf for naked American power. Likewise, successive American presidents (as well as Indian leaders) over the past two decades have extolled India’s success as a liberal democracy and regarded its political system as a lynchpin of the United States’ strategic partnership with India. Naturally, these were the first three things the Americans noticed after arriving on the Indian subcontinent. And as it has been demonstrated numerous times in the past, almost all of them were repelled by the primitive rituals and practices of the Hindus. This shaped the American politics for much of the 19th and the first half of the 20th century: compared to the “beastly” Indians and their outdated Hindu religious views, Muslim Pakistan and Afghanistan seemed like much more suited to be allies. Even though Americans – and Europeans – were appalled by the rigid social hierarchy of the Hindus, they based their judgment of South Asians on unscientific ideas of racial superiority. And even after the Nazis “had discredited overt racism in international politics,” this old hierarchical view hasn’t disappeared to this day. However, as an interesting backlash, these notions of hierarchy are continually being subverted by American intellectuals, and on a pretty familiar terrain: religion. Namely, after the 1970s, many European and American intellectuals have started seeing values in Eastern religions leading to a sort of a South Asian cultural and religious boom which is still going on. In fact, one could even argue that nowadays it seems much more modern to be a Hindu or a Buddhist (and practice yoga and meditation) than to be a Christian or a Muslim and go to church. The first American ship sailed to South Asia in 1784; back then, the flag on the vessel was still unrecognized by most of the world and the Indians who saw it first were no exception. As we said above, the reason why the American arrived in South Asia was simple: profits. They knew everything about it through the British East India Company which ruled the subcontinent and exported large quantities of Indian produce (especially textiles and spices) to the American colonies. However, the British East India Company was just too big to be meddled with (or fail), and for the next century and some, America wasn’t that interested in South Asia. Theodore Roosevelt liked the poem so much that he grew liking the British Raj as well and called for American colonization of the Philippines. In addition, Swami Vivekananda’s “Sisters and brothers of America” speech introducing Hinduism at the Parliament of the World’s Religions of Chicago in 1893 received a standing ovation from thousands of US citizens. There was an even bigger fascination for Mahatma Gandhi back in the US, but the partition of Pakistan from India in 1947 led to Harry Truman’s arms embargo on both countries. So, it provided financial and political aid until the “dangerous decade” between 1970 and 1980 when the world was on the brink of a nuclear war because of the inherent problems in the political landscape of modern South Asia. At the end of the decade, the Soviet invasion of Afghanistan opened new problems for the US, and for a while, it looked as if the world’s Western superpower had lost its primacy over South Asia to the Soviet Union. The United States got closer to Pakistan because of Afghanistan, but this threatened its relations to India. During the Soviet invasion of Afghanistan, the US-funded Islamic extremist organizations such as Al-Qaeda and Taliban in the hope that this would weaken the Soviet influence. However, it was these very two once-allies which became USA’s greatest enemies after the end of the Cold War, a quite conflict which culminated in the terrorist attacks of 9/11 and the American invasion of Afghanistan. In recent years, the US interest in India and Pakistan has been mainly governed by the fears of a nuclear war between the two countries and the rise of China on the East. As a consequence of the latter, the current Indian government led by Narendra Modi is the first one to explicitly “tilt heavily” toward America, in an attempt to mend the “power gap” opened between India and China – something which the USA has wholeheartedly embraced. According to Srinath Raghavan, USA’s interests and involvements in South Asian history can be understood through three lenses: power and profit, ideology and culture. Historically, it all began with an attempt to profit from the vast market of the Indian subcontinent: the first Americans to arrive there had been merchants. After several attempts to change the “primitive” cultural landscape of the regions, America’s foremost interest was ideological: the USA wanted to win the Cold War and India, for example, was a Non-Aligned country. Even though it’s hard to believe this in retrospect, after their first arrival on the Indian subcontinent, the Americans were so appalled by the primitive rituals of Hinduism that they thought they’d have a much better understanding with the Muslims. And this went on for a while until the military backing of Al-Qaeda and Taliban (as an indirect way to weaken the Soviet Union) backfired and resulted in the 9/11 attacks. Interestingly, now Hinduism, Buddhism and other religions and practices of the subcontinent are all the rage this side of the Pacific. Srinath Raghavan’s main point of the book is that the USA has never completely bothered to understand South Asia, resulting in a series of costly mistakes. We promise you that, once you finish this book, that’s exactly how you’ll feel about it.